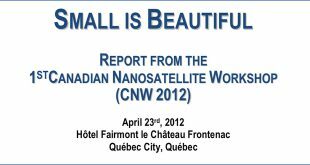 The final report form the First Canadian Nanosatellite Workshop recently held on April 23 in Quebec City has been released. 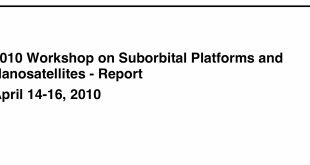 Organized in conjunction with the Canadian Aeronautics and Space Institute (CASI) ASTRO 2012 Conference the workshop was a result of a previous Canadian Space Agency workshop in 2010 which recommended the establishment of an annual Canadian forum on nanosatellite activities. See how the European Space Agency’s ATV-2 nicknamed the Johannes Kepler was made. From pieces and parts to mighty spacecraft sitting atop of Ariane 5 launcher. The Johannes Kepler will carry approximately 6.6 tonnes of cargo to the International Space Station on a resupply mission. ESA’s ATV’s are sent on resupply missions approximately every 17 months. The recent announcement by Microsat Systems Canada (MSCI) CEO David Cooper that his company is “launching a new initiative” to build a constellation of 78 small, relatively low-flying satellites designed to relieve internet and smart phone congestion and provide broadband access in rural locations, highlights the differences between small space focused Canadian firms and their larger commercial satellite and internet service provider cousins. 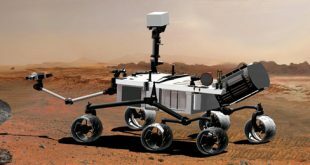 The Canadian Space Agency today awarded Engineering Services Inc. (ESI) of Toronto a $3 million contract to develop prototype robotic arms, control stations and exploration tools that will be integrated into prototype lunar or martian rovers. The contract also includes an option for second arm worth $500,000. 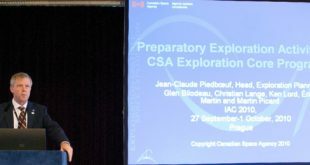 Building academic capacity in the Science and Technology space sector is a priority of the Canadian Space Agency (CSA), in particular through promoting the use of accessible and cost effective suborbital platforms and nanosatellites that can accommodate research and graduate student training. The University of Saskatchewan Space Design Team (USST) arrived early this week at NASA’s Dryden Flight Research Center as one of the favorites to win up to $2 million in prize money at the NASA sponsored Centennial Power Beaming Challenge. Unfortunately for the student team, technical issues throughout the week resulted in a disappointing outcome. NASA today successfully tested the agency’s next-generation spacecraft and launch vehicle system, called Ares I-X. The flight test provided NASA with an early opportunity to test and prove flight characteristics, hardware, facilities and ground operations associated with the Ares I.